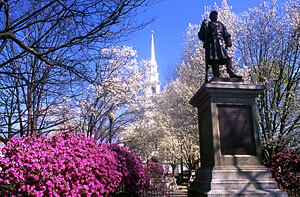 Monadnock Region Southwest New Hampshire: Monadnock Region Hotels, B&Bs, Inns, Lodging, Dining, Attractions, Shops in NH. A visit to Southwest New Hampshire's Monadnock Region brings back memories of a simpler time. Quaint New England villages with their white-washed steeples decorate the countryside. Scenic lakes, streams and rivers abound. Quiet country roads beckon, many featuring covered bridges. But, don't let the peaceful landscape fool you  there's always plenty to do. Tour the many museums and historical sites; take a drive through the countryside; spend time exploring the charming towns and villages that make up the region. Take a hike up Mount Monadnock. You'll discover a New England reminiscent of a "Currier and Ives" painting, a corner of New England that's a world apart. Perhaps the greatest aspect of a vacation in Southwest New Hampshire is that you can set your own pace. Discover the beauty and charm in your own way  and stay as long as you like. Welcome to SouthwestNH.com! This web site has been designed to be a comprehensive online resource about the Southwest corner of New Hampshire, known as the Monadnock Region. You'll find it chock-full of information about where to stay, where to eat, and what to do while you're here. You'll also find lots of information about our most famous landmark: Mt. Monadnock. We think it will also give you a compelling reason to come visit us. Whether you live in Massachusetts, Connecticut, Rhode Island, New York, or New Jersey, you'll find us an easy drive  and a great place to get away from it all. When you're done exploring the Monadnock Region on this web site, be sure to stop by and visit our Facebook page. It's chock full of photos and local information about us. You can ask questions, post photos of your own and become a part of this great community! We also offer a printed version of much of the information available here on the site. You'll find it FREE at a wide variety of Restaurants, Lodging Establishments, Chambers of Commerce and Rest Areas here in the region. Be sure to look for it when you arrive!! Site copyright © 2001 - 2019 - SouthwestNH Guides - All Rights reserved.